What is the easiest way to get these headers to work on my gsr. The header will bolt to the block but the mounts are different then the mount that is on the cat. Any easy way to get this to work? all b-series header are interchangable, but the cat flang are placed different. any shop will do it. Cross my name, i no longer own an integra..but i still have a lot of parts left. lol and that makes them interchangeable? lol, i was talking about the part the goes onto the head is interchangeable. but here is a picture of the a-pipes. Where are the b16's and b20's at? doesnt apply here. we are talking about his gsr. 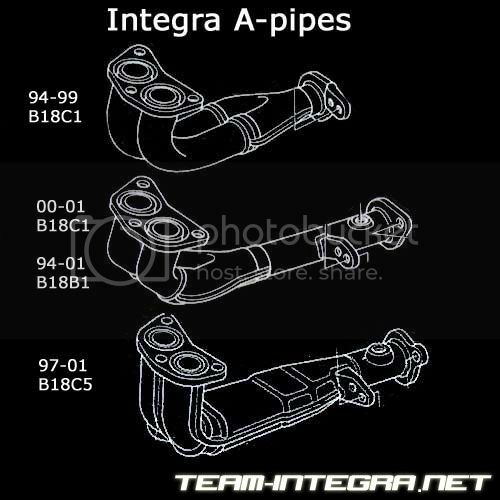 if you must know, the b16 falls under the 00-01 gsr and the b20 falls under 94-01 ls, a-pipe to cat flange wise. We're can I get one of then interchangeable parts at bro? Having the flange on the cat welded in the same position will probably be cheaper though.